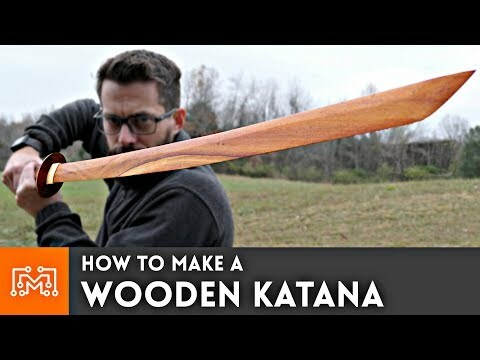 I was inspired to make a wooden katana using left-over hardwood flooring! Most of the sword is made from left over cumaru teak flooring that I recently used in our house. It has a really beautiful grain pattern and some elegant figuring, plus it's extremely dense and hard. I had just finished watching Alec Steele's series on making a Damascus steel katana, so I had a rough idea on how the whole thing went together. After researching how katana hilts are wrapped in cotton or silk strips, I decided to recreate that look with an inlayed contrasting wood. I had a piece of scrap oak flooring from my boys' room which would look awesome against the teak hilt. While I worked on other projects, I had my friend Josh CNC out the hilt design and the resulting diamond pattern looked just like a traditional fabric wrap. I hogged out the inside of the hilt to receive the tang and once I got a snug fit, it was time to assemble the major components.